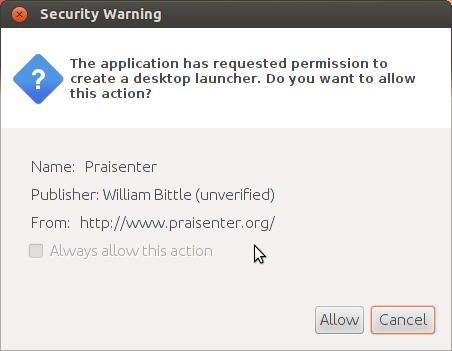 Praisenter mostly works on Ubuntu. Mileage on other flavors of Linux may be different, but our focus is on the Ubuntu distribution. ** As of the latest release, the last remaining issue is animation flickering with transitions and video. First, you must have Ubuntu 11.10 or higher 32 or 64 bit. You can check this by going to the “Gear” in the top right corner of the screen and choosing “System Settings…” then click “Details.” Here you will see the version of Ubuntu you have. You also need to make sure you are running the latest version of Ubuntu by going to the “Gear” in the top right corner of the screen and choosing “Software Up to Date.” You should install any updates that are found. This should print something along the lines of “java version 1.7.0_21.” If the version starts with 1.7 then you have Java 1.7 installed. Close the terminal. If not, then you need to install the latest Java. Type “Java” in the search bar. If there is a check on “IcedTea Java Plugin” then skip to step 5. Click the “IcedTea Java Plugin” and click the “Install” button. If there is a check on “OpenJDK 7 Runtime” then skip to step 7. Click on “OpenJDK 7 Runtime” and click the “Install” button. Close the Ubuntu Software Center. Again, type in the number corresponding to the Java-7 item. This should now print “java version 1.7.0_21” or something close. 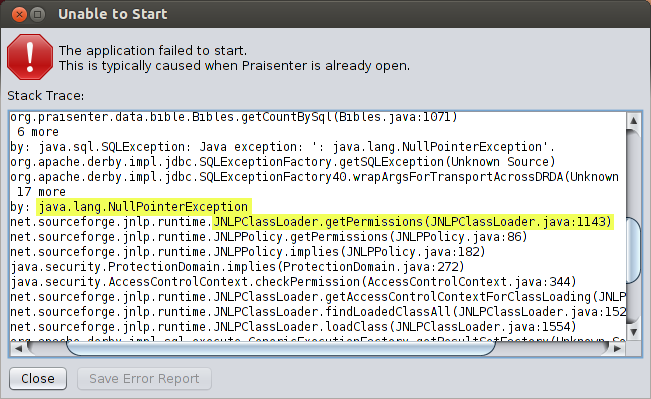 After Java 1.7 is installed you should be able to download and run Praisenter. For some reason if you install “IcedTea Java Plugin” after installing “OpenJDK 7 Runtime”, Java 6 gets installed. 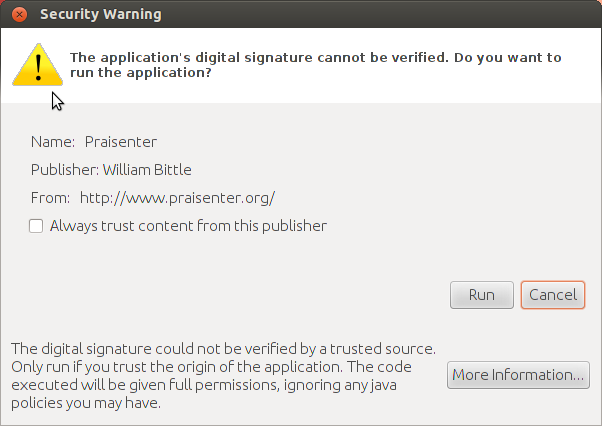 This is why its good to do “update-alternatives” to verify what version of Java is the default. Praisenter offers two different downloads: Webstart (recommended) or Archive. Please review the license before downloading or using Praisenter. This is the recommended download, but requires internet access when run the first time. The Webstart download has the benefit of automatic updates (when an internet connection is available) and creation of a desktop shortcut/icon. Double click the Praisenter.jnlp to run. Click the “Run” button to continue. You can check the box “Always trust this publisher” so that you won’t be prompted for this again. You may also be prompted to create a desktop shortcut. Click allow to create it. Use the Archive download instead (recommended). Attempt to revert your version of IcedTea to an earlier version using something like Synaptic Package Manager. Download and install Oracle Java from http://www.java.com (which comes with its own Webstart implementation) and use it instead of OpenJDK. Attempt to build a newer version of IcedTea. ** As of this writing Ubuntu 13.04 only has one version, 1.3.2, which has this problem. Whenever downloading a new version of Praisenter using Webstart you should clear the Webstart cache. The desktop shortcut may not be created if this is not done. To clear the Webstart cache open the “Terminal” app and type: javaws -Xclearcache. The Archive download does not require internet access to run. However, the archive does not perform automatic updates. This download is easier to get running on Linux since it only requires Java to be installed (IcedTea plugins not required). You can set this as the default by right clicking Launcher.jar and choosing “Properties.” Go to the “Open With” tab and choose “OpenJDK Java 7 Runtime” from the list and then click the “Set as default” button. Afterwards you can simply double click the Launcher.jar to start Praisenter. To fix this, right click on the Launcher.jar file and choose “Properties.” Then go to the “Permissions” tab and check the “Allow executing file as program” option. Then click the “Close” button. Running the Launcher.jar should work now.